Nike wants investors to know that the strength of its business extends beyond Colin Kaepernick. Nike delivered strong results in its most recent quarter, including double-digit growth in sneaker and clothing sales, digital sales and profit compared with the same time last year. While shares of Nike have climbed about 36% this year, it seemed investors wanted even more from the company. Nike (NKE) stock was trading down about 4% after hours. Tuesday's results were promising for a company that struggled last year as rival Adidas (ADDDF) gained popularity, and shoppers turned away from Nike's Jordan brand. There was also good news in North America, the company's largest market. Sales rose 6% last quarter compared with a year earlier. "In North America, we have returned to strong, sustainable growth," Nike CFO Andy Campion told analysts on a call Tuesday. The latest quarter did not include September, when the company made Kaepernick a face of its "Just Do It" campaign. The former San Francisco 49ers quarterback, who has not played in the NFL since the 2016 season, sparked a firestorm when he sat and later knelt during the National Anthem to protest police brutality and racial injustice. President Donald Trump even rebuked Nike after the campaign launched, asking, "What was Nike thinking?" on Twitter. Nike's decision was a bet on its core customers: Younger Americans in big cities. 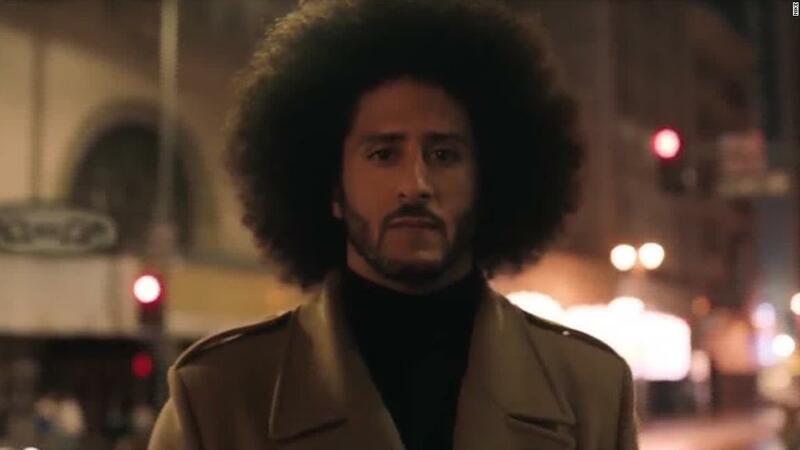 More people aged 18 to 34 supported the Kaepernick ad than those who opposed it, according to an SSRS Omnibus poll provided exclusively to CNN earlier this month. Tuesday's results gave another sign that Nike made the call from a position of strength. Nike didn't bring up Kaepernick during its call with analysts. But CEO Mark Parker was asked whether he was concerned about the controversy. "We feel actually very good and very proud of the work that we're doing with 'Just Do It,'" Parker said. "We've seen record engagement with the brand as part of the campaign." Nike, the world's largest sports footwear and athletic company, has reinvented itself for the digital era. Nike wants to sell more shoes and clothes directly to consumers, instead of through retailers. These sales carry higher margins and also give Nike total control over how its products are displayed and marketed. "Nike is in the early innings of a transition from a traditional wholesaler to a retail tech company," Morgan Stanley analysts said in a report last month. The company has taken several steps toward its goal, including narrowing its focus to a dozen major cities, cutting out struggling retail partners and relaunching its membership app, NikePlus. Nike's tactics appear to be working so far. Digital sales jumped 36% last quarter compared with a year earlier. The company is also getting its flagship products right. Shoes like Nike React, Air Max 270, VaporMax, and ZoomX have landed with customers. "The success we're seeing today starts with great products. It's ultimately where the consumer cast their vote. Our innovation platforms are building a foundation for growth over many years," Parker said.